Probably the improvement of the native stock began around 1750 when it was crossed with other breeds. The principal blood used in improvement was that of the Teeswater stock, which later was largely used in the formation of the Shorthorn breed in England. A majority of the breeding in the Teeswater was from Dutch or Flemish cattle that also were used in the formation of the Holstein breed. Animals from the West Highland and improved Shorthorn were to improved the original Ayrshire stock. There is also considerable evidence that cattle from the Channel Islands were used in the improvement of the cattle of Ayr. It is to the credit of the Scottish farmers that they used any available improved stock that they felt would improve their cattle for practical use in their area. Regardless of the details of origin, the early breeders carefully crossed and selected the various strains of cattle to develop the cow we now know as the Ayrshire. She was well suited for the land and climate in Ayr. She was an efficient grazer; noted for her vigor and efficiency of milk production. She was especially noted for the superior shape and quality of her udder. The composition of her milk made it ideally suited for the production of butter and cheese by the early Scottish dairymen. 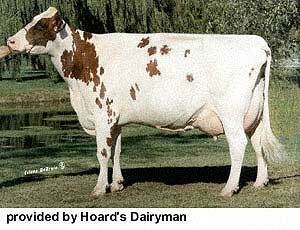 Ayrshires are red and white, and purebred Ayrshires only produce red and white offspring. Actually, the red color is a reddish-brown mahogany that varies in shade from very light to very dark. On some bulls, the mahogany color is so dark that it appears almost black in contrast to the white. There is no discrimination or registry restriction on color patterns for Ayrshires. The color markings vary from nearly all red to nearly all white. The spots are usually very jagged at the edges and often small and scattered over the entire body of the cow. Usually, the spots are distinct, with a break between the red and the white hair. Some Ayrshires exhibit a speckled pattern of red pigmentation on the skin covered by white hair. Brindle and roan color patterns were once more common in Ayrshires, but these patterns are rare today. For many years, the Ayrshire horns were a hallmark of the breed. These horns often reached a foot or more in length. When properly trained, they gracefully curved out, and then up and slightly back. When polished for the show ring, the Ayrshire horns were a spectacular sight. Unfortunately, the horns were not very practical, and today almost all Ayrshires are dehorned as calves. 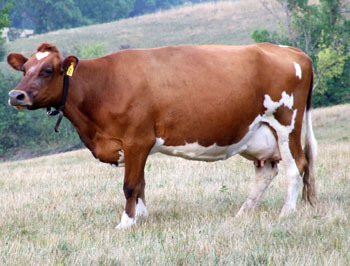 Ayrshires are medium-sized cattle and should weigh over 1200 pounds at maturity. They are strong, rugged cattle that adapt to all management systems including group handling on dairy farms with free stalls and milking parlors. Ayrshires excel in udder conformation and are not subject to excessive foot and leg problems. Few other breeds can match the ability of the Ayrshire to rustle and forage for themselves under adverse feeding or climatic conditions. Ayrshire cattle will do better under pasture conditions than will the other major dairy breeds and , when pastures are poor, they need less grain to keep them in air condition (C.H. Eckles, Dairy Cattle and Milk Production, 1923). The ruggedness of the terrain and the unfavorable climatic conditions of their native land led to the selection for those points of hardiness that adapt them to less than ideal conditions. These traits make Ayrshires outstanding commercial dairy cattle. Other traits that make Ayrshires attractive to the commercial dairyman include the vigor of Ayrshire calves. They are strong and easy to raise. Ayrshires do no possess the yellow tallow characteristic that would reduce carcass value, so Ayrshire bull calves can be profitably raised as steers. The Ayrshire is a moderate butterfat breed. The actual average of all Ayrshires on Official DHIR test is over 12,000 pounds of milk with a 3.9% test. Ayrshires respond to good management and feeding practices and individual Ayrshire herds average as high as 17,000 pounds of milk and 700 pounds of butterfat. Top producing Ayrshires regularly exceed 20,000 pounds of milk in their lactations. The current world record for Ayrshire is held by Lette Farms Betty's Ida. In 305 days, on twice-a-day milking, she produced 37,170 pounds of milk and 1592 pounds of fat. The Ayrshire Breeders' Association does not officially recognize records in excess of 305 days, but one Ayrshire has produced over 41,000 pounds of milk and 1800 pounds of butterfat in 365 days. The first importations of Ayrshires to the United States was believed to have been made by Henry W. Hills, of Windsor, Connecticut, around 1822. Farmers in New England needed a dairy cow that would graze the pastures of their rough, rocky farms and tolerate the cold, often inhospitable winters. In many ways, the environment in New England was very similar to the Ayrshire's native Scotland, and she thrived in her new home. Even today, the Ayrshire is very popular in New England, but her popularity has spread and the Ayrshire herds are now located in every part of the United States including the Deep South. The largest numbers of Ayrshires are registered each year in New York, Pennsylvania, Ohio, Wisconsin, Minnesota, Iowa and Vermont. During the early part of the Twentieth Century, Ayrshires were noted for their extremely good type. Old photographs of Ayrshire cattle confirm this fact. To demonstrate their hardiness, the Ayrshire Breeders' Association staged one of the most spectacular promotional events ever conducted by a dairy breed registry association. In 1929, two Ayrshire cows named Tomboy and Alice, were literally walked from the association headquarters at Brandon, Vermont, to the National Dairy Show at St. Louis, Missouri. Both cows not only survived the trip, but calved normally and went on to produce outstanding milk records of the time. During the Twenties and Thirties, many Ayrshire herds were established near cities. Some of these farms bottled and distributed their own milk. In the late Thirties, the Ayrshire Breeders' Association established the Approved Ayrshire Milk program. The program served the purpose of promoting Ayrshires by promoting their milk. To qualify, a herd had to be comprised entirely of Ayrshires, and the herd owner had to maintain the highest health standards. Promotional materials from the time stated that Ayrshire milk had a better flavor. It also emphasized the unique composition of Ayrshire milk and made it more healthful, especially for children and babies. The promotional literature recommended that mothers give their children Ayrshire milk to be sure they grew up to be strong and healthy. Milk marketing, like herd management, has changed and the Approved Ayrshire Milk program is no longer in operation. However it is interesting to note that the promotional themes of the Approved Ayrshire Milk program were very similar to those of modern milk marketing campaigns. The development of the Ayrshire breed is a story of dedicated people as much as it is of great dairy cattle. Farmer breeders, whose livelihood depend on their cattle, along with wealthy hobby farmers and talented and dedicated herd managers all share equal credit for their contributions to the development of the Ayrshire breed. The Ayrshire cow is universally recognized as one of the most beautiful of the dairy cattle breeds, but much more important is the fact that she has been bred and developed to be a useful and profitable dairy cow. With proper feeding and management, the Ayrshire will produce at a profitable level for her owner. By using the modern breed improvement tools of DHI or DHIR testing, type traits appraisal, and artificial insemination, an Ayrshire breeder can be sure of breeding better Ayrshires to meet the demands of the modern dairy industry.